Talk-thru communicator is designed for applications where a cutout in the barrier is impractical. The inside (Master) station comes with a gooseneck microphone, volume controls, and an extended gooseneck microphone. This model is recommended for most applications where there isn’t an existing hole in the glass. Two-way communication is accomplished through the use of speakers and microphones located on each side of the partition. The master unit is equiped with a 20" gooseneck microphone, power on/off switch, power-on LED, and external volume controls. The Remote unit is vandal-resistant with all controls located within the housing. 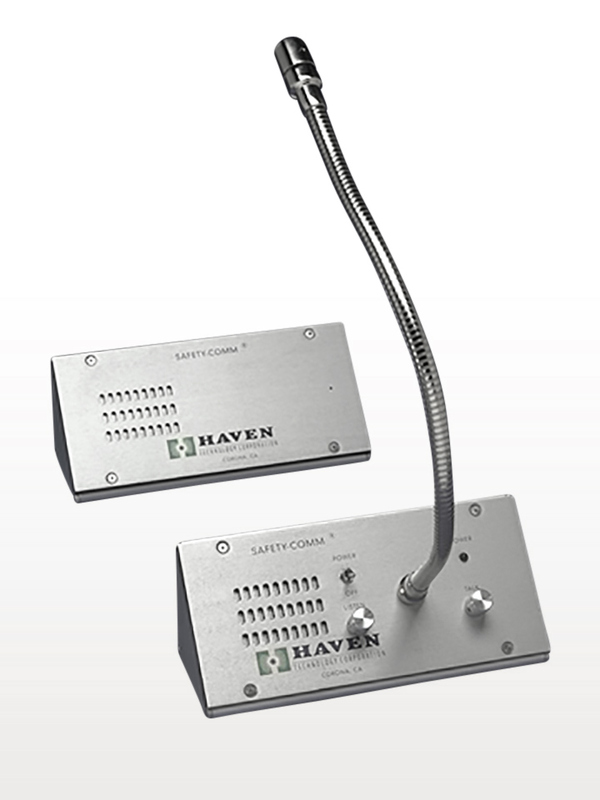 The SC-300 provides electronic two-way, hands-free audio communications (duplex) between a partition. The SC-300 is fully operational between 0°C and 50°C. time based on 25% talk-time.